"What a lovely way to spend an afternoon"
"Beautiful gardens, designed and cared for with such love and commitment. Thank you for sharing." "Very friendly residents, fascinating gardens, delicious refreshments"
On one weekend each year, a large number of residents open their gardens to their neighbours and to visitors from further afield. We are expecting to open 27 gardens on Saturday, and 25 gardens on Sunday. 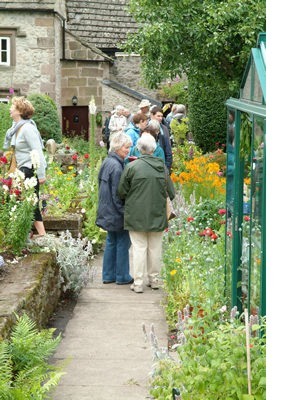 Visitors follow a garden trail around the streets and alleys of the village, exploring a wide variety of gardens. There is a Gnome Hunt for children, and scarecrows to find in a number of gardens. We offer a wide range of refreshments - in our award-winning (and fully accessible) village hall and in several gardens - from cream teas to home-made desserts. Soft and alcoholic drinks will be available in a number of locations. There will be plants from Winster-based Peak Cottage Plants, and quality local crafts for sale, and there will be live Jazz in one of the gardens each day. Winster Morris Dancers will perform at 5pm on Saturday. There will be a 45-minute concert by the Wyns Tor Singers at 4.30pm on Sunday afternoon. The event is run in aid of the Burton Institute, Winster's award-winning village hall, and other Winster organisations. 1.30pm to 5.30pm each day. Winster is on the B5057 (which runs from the A6 at Darley Dale). The B5056 (Bakewell to Ashbourne) skirts the top of the village. See Map. Very limited parking in the village itself, but we have a large free car park in a field at the top of the village (on the B5056 above Miners Standard pub), which will be open from 1pm. We run a free Park and Ride minibus service (with wheelchair lift) from the car park to Main Street and back - or you can walk (gently downhill) from the car park to the first garden in about five minutes. If you are driving into Winster from the East (Matlock/Darley Dale), the signposted route to our car park may seem a little unlikely, but please trust our signs: the shortest route involves a steep, narrow road which can jam up quickly - so we have signposted a route round the edge of the village on wider, safer roads. Car Park is at (53.136358,-1.647223) - 150m south of postcode DE4 2DR. Or use Plus Code "49P3+J6C Winster" on Google Maps. Your ticket is in the form of a Gardens Map, and this has a broad assessment of each garden's accessibility. Winster is a hilly village, and some gardens are impossible for the less mobile, but we aim to open several gardens that are accessible to the "walking but wobbly" and to wheelchair users with reasonably fit attendants (most of the flatter gardens have at least one or two steps). Most gardens have uneven paths, so those with poor vision would need a fully-sighted companion. Our village hall, the Burton Institute, is open on both days (with our splendid Winster Tapestry on show) and is fully accessible, including disabled toilet facilities. The gardens map clearly shows which gardens accept dogs on a lead - just over half of them do: mostly to the whole garden, but for a couple this is just for part of the garden. In 2018, day tickets cost £4.50 per person (children free, but must be accompanied) - or £7 per person for a 2-day ticket. Tickets are on sale on the day, from outside the Market House in Main Street, and from the Car Park.